When it comes to walking in a winter wonderland, what better way for couples to show their love than getting married in the colder and crisper months? With no guarantee of good weather during the summer months, many couples appreciate the style of a winter wedding and this will impact on the style of the wedding. 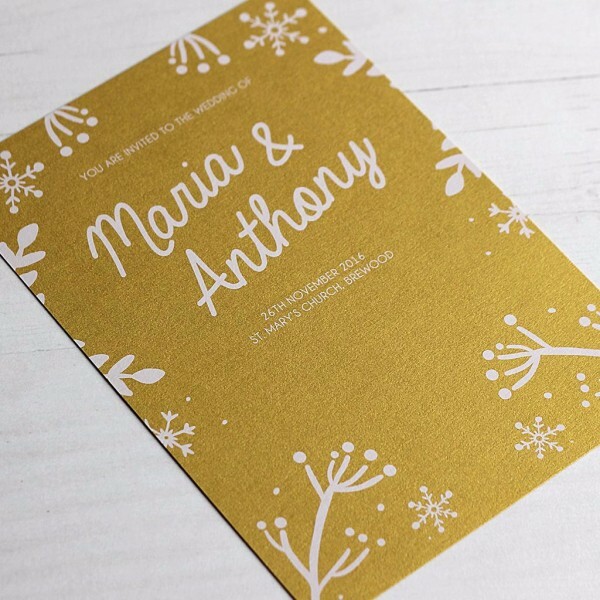 Any couple that is having a winter wedding will be advised to choose a winter theme for their invitation and this winter festive style is a card that really grabs the attention. The card is a sparkling gold card, standing out on any wall or mantelpiece and there is an extremely festive look and feel to the card. The card is topped off with white wink adding holly and snowflakes, and personalised text is also included with white text. The card can be fully customised so if you are looking to place your personal spin on the card, you can do so with ease. There is a cut off RSVP card available with the winter festive design, which comes with a print on both sides of the A5 card. If you require additional space to provide more information about your big day, there will be plenty of chances to do so. For a card that has such a grand background, there is a simple style at the front of the card, focusing on the married couple and the time and date of the wedding. This ensures that even amidst the glitter and the glamour of the card, the most important aspects of the wedding invitation stand front and centre, order from The Pretty in Print Company.